Wisła Can-Pack has continued to make all the right moves both on the court and in the transfer market. They have had a breathtaking run of victories in the Polish League and are still shining bright in the international EuroLeague Womens’ tournament, despite the loss of two key players. The White Star ladies are 17-1 and one in Poland, with CCC Polkowice trailing them by a single point in the standings. 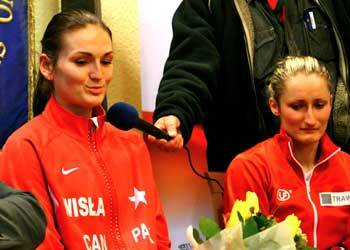 The team has lost both American centre Janell Burse, and then team captain Dorota Gburczyk-Sikora to pregnancy. Burse was struggling to perform to her own high standards this season, puzzling the coaching staff until, after tests, she announced that she would be leaving the club permanently at the end of December. Burse has returned to Houston and has indicated that she will probably no longer play outside of the United States. Then recently married Gbcurzyk-Sikora, who has played with Wisła Can-Pack for 11 years, will remain with the club in spirit after making her announcement, visibly moved, at a press conference where she was applauded and presented with flowers in congratulations and thanks for her years of leadership at the club. Ewelina Kobryn has succeeded Gburczyk-Sikora as captain. The team also added forward Nicole Powell, a number three overall WNBA draft pick, as they prepare to face Russian Cup champs Nadezhda Orenburg in the first round of Euroleague playoffs in early February.